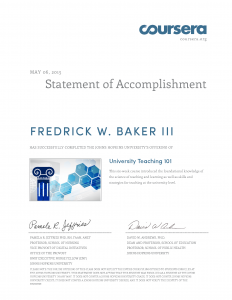 Professional Development – Fredrick W. Baker III, Ph.D. 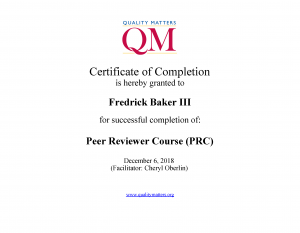 I completed Quality Matter’s Peer Reviewer Course three week-long intensive online course on December 6th, 2018. 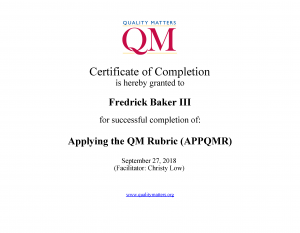 The workshop refreshed us on the rubric and we undertook extensive practice in writing and evaluating reviews while learning to write recommendations befitting the QM standards. The course was challenging and fun! 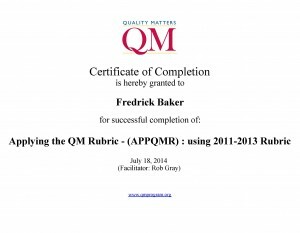 I completed Quality Matter’s Applying the QM Rubric week-long online course on September 27th, 2018. The workshop introduced the rubric, walked us through evaluating whether certain standards were met or not through reviewing an existing course, and differentiated the essential standards, alignment, etc. 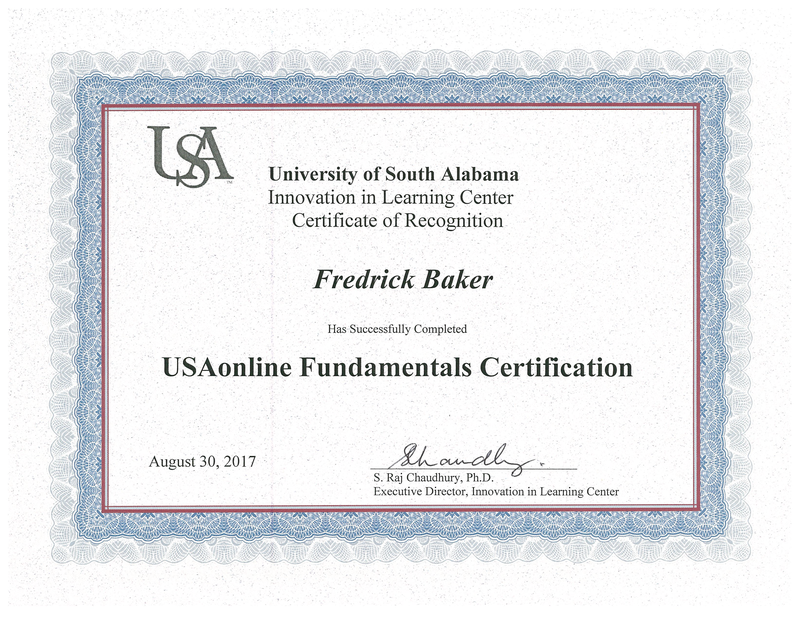 This was interesting because I was in the team that transitioned USA from eCollege into Sakai, and helped found the first efforts toward this USA Online training. 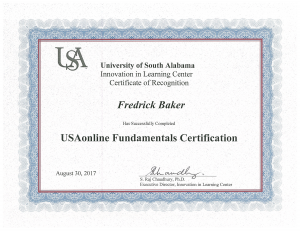 I recently got the opportunity to teach online for USA, and had to go through the training! It was fun and I appreciated the chance to test out of some of the features! 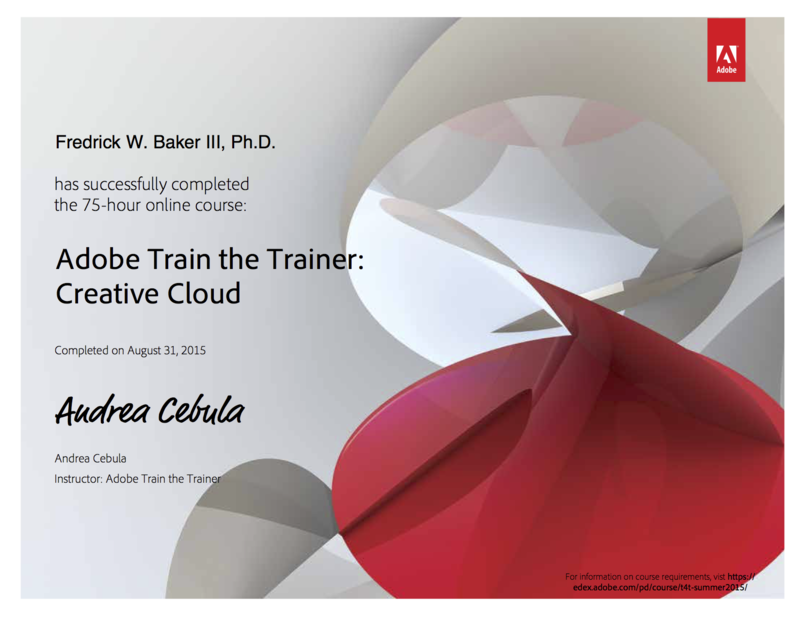 I am now a Certified Adobe Education Trainer! In September of 2015, I completed a 75 hour training course on the Adobe Education Exchange (EdEx) focused on the keys to effective training design. I created a training plan on a 90 minute Creating Accessible Syllabi session, and it is now shared as a resource inside the Adobe EdEX platform. For completing the course, I received a badge and a certificate. I completed Atomic Learning’s Articulate Storyline training on March 11th, 2016. 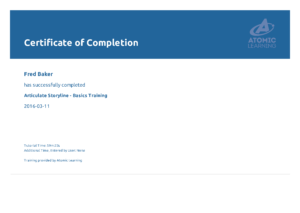 The course provided an introduction to many of the basic and intermediate functions of Articulate Storyline 2. 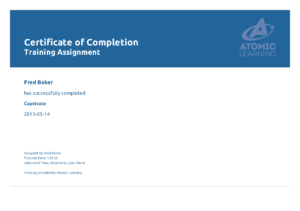 I completed Atomic Learning’s Adobe Photoshop training on June 4th, 2015. The course provided an introduction to the newer tools and features of Photoshop Creative Cloud 14. 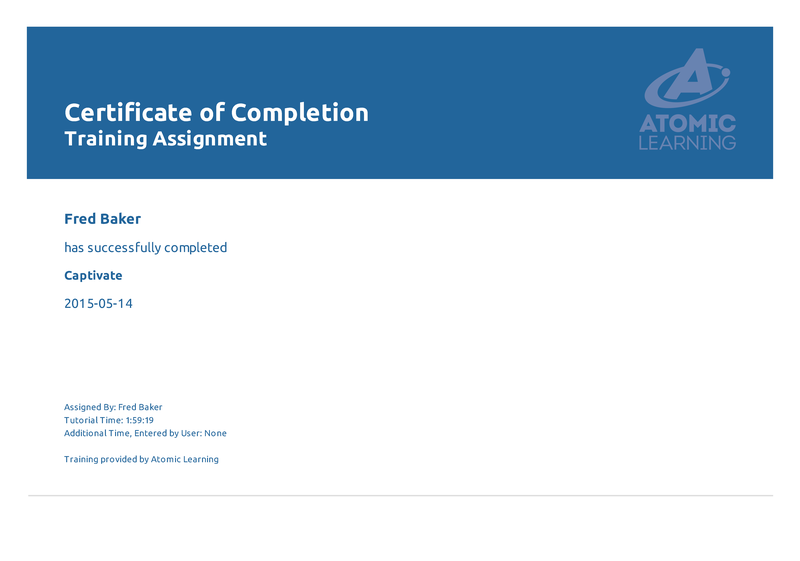 I completed Atomic Learning’s Adobe Captivate training on May 14th, 2015. The course provided an introduction to many of the basic and intermediate functions of Captivate. I also completed Adobe Education Exchange’s Up & Running with Captivate Course on May 12th. 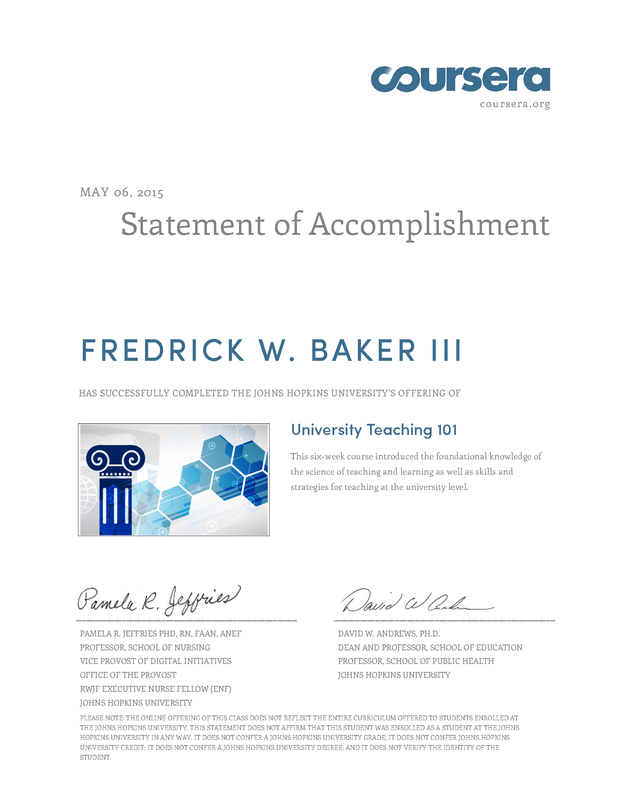 John’s Hopkins provided a MOOC about University Teaching through Coursera. I completed the course on May 6, 2015. The course covered alignment, learner analysis, highlighted best practices for instructional design, assessment, and more. I completed the Online Learning Consortium’s Designing for Accessibility course on April 8th, 2015. 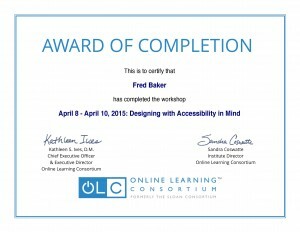 The course highlighted best practices for creating accessible courses and provided a host of resources. I completed Atomic Learning’s Designing Accessible Courses training on March 26th, 2015. The course highlighted best practices for creating accessible courses and discussed Sections 504 and 508 compliance. I completed Atomic Learning’s Designing Accessible Presentations training on March 31st, 2015. The course discussed methods for using PowerPoint 2010 to create accessible presentations. I completed Atomic Learning’s Designing Accessible Syllabus training on March 26th, 2015. The course discussed methods for developing accessible syllabus components. 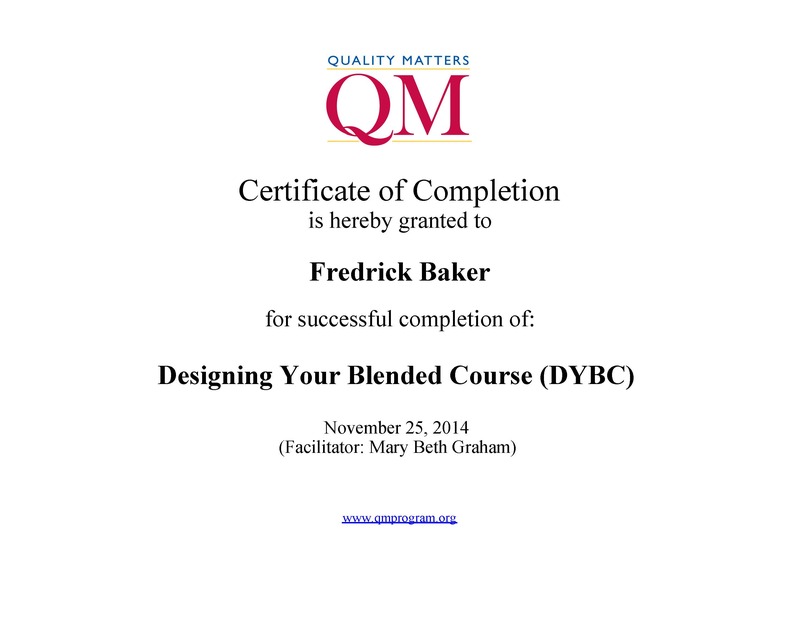 I completed Quality Matter’s Designing Your Blended Course 2 week long training on November 25th, 2014. 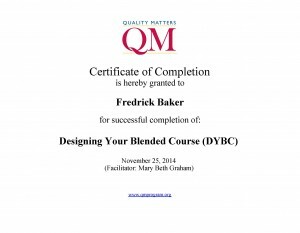 The course highlighted course alignment, differences between f2f, hybrid, and online modalities, and how to use the QM rubric to check course elements. 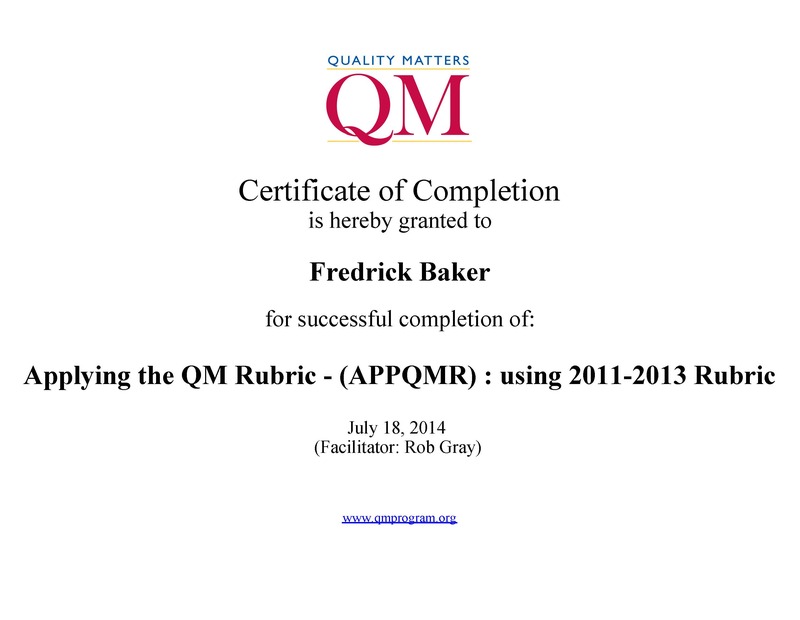 I completed Quality Matter’s Applying the QM Rubric 8 hour training on July 18th, 2014 as part of a larger instructor boot-camp workshop. The workshop introduced the rubric, highlighted the essential and tertiary standards, discussed the review system, and allowed us to create and critique standards.